Sometimes hosses need to run. I'm about tired of being forced to stay in the stable and I could definitely use a karma changer, as I've been running like crap this month, so I've given it some thought and I'm going to do something next week. I'm going to give the TIC 2% of me in the two HPT tourneys that I'm going to be playing. It may turn out to be nothing (the way I've been running) but then again, as Marvin always says... One Time Big Time.. I just might be due. The first tourney is Event 1, a 2-day event that starts on April 19th. $230 buy-in, 15k starting stack with 30 min levels. The second tourney is Event 3, a 2-day event that starts April 21st. $340 buy-in, 20k starting stack with 40 min levels. Waaaaaay above and beyond bro!!! Much thanks from ALLof us here! JW you are a star, I hope you run like god sir. The very best of luck. Thanks John hope you run like GOD. Lots of luck at the tables, John. I know you got the skills, so a tiny bit of luck is all you need to run deep and crush those events. Sending you run good wishes for the HPT John. Absolutely due, I feel it in my bones!!! GL in ur events, John!!! Well, event 1 was a total washout. People chasing and hitting everything against me. Hope that I turned the tide a bit today though. Played a $50 STT satty and binked it, so event 3 is now only costing me 1/2 of what it should have. Hopefully that run continues in Event 3 tomorrow. gl in event #3, John!!! Hope you get lots of run good, John. Congrats on satty win and best of luck in event 3. 181 started, top 18 get ITM (min cash is $860). 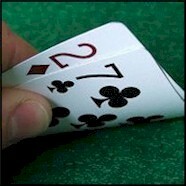 I do ok the first 2 hrs, then go card dead for 4 hours, where I win a whole 3 hands (2 were blind steals). After dinner break (with about 70 left), I got to where I needed to start accumulating chips or I'd be in shove/fold mode. I've now played two $300 buy-in tourneys in St Louis, today's HPT and a WSOPC. Both times, I lost hands that would enable me to cash, both with AA beat by JT spades. Very unlucky time for the 20% to win out John. Congrats on the satty bink though and get'em next time.